57% of marketing influencers indicated that a digital marketing plan is very successful at accomplishing important objectives, describing it as best-in-class. 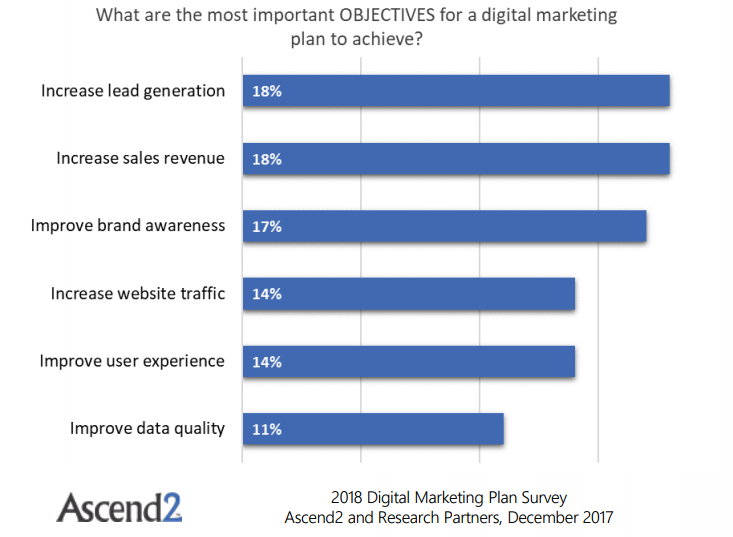 18% of the marketing influencers indicated also that increasing lead generation and sales revenue are their most important objectives for a digital marketing plan to achieve. 17% considered that improving brand awareness as the most important objective to achieve in a digital marketing plan. A Graph Shows The Most Important Objectives For a Digital Marketing Plan To Achieve. For more information, kindly check the “2018 Digital Marketing Plans“ full report.